Transform your school playgrounds with our vibrant synthetic turf in Melbourne. At Xtreme Turf we specialise in fake grass installation, turf maintenance and repairs for schools. Our products are perfect for those wanting stress free maintenance of their school grounds. Our artificial grass products look just like the real thing, are durable and useful for a wide variety of purposes. Your school grounds will never look better than with our fantastic products! We have a huge range of short and long pile grass that can be easily installed at schools for any sporting activity. They are perfect for soccer ovals, multi-sports surfaces, rugby, hockey, cricket pitches, and much more!. The products we provide are custom made to your specifications and colour choice. Our expert team can develop suitable artificial sporting surfaces for your existing asphalt as well as revamp your cracked basketball court or concrete playground to provide a safe recreational area. You can even choose to have your school branding and logo on your new turf! All of our surfaces meet the tough Australian regulations, and include ‘Soft-falls’ to reduce the risks of child injuries. ‘Soft-falls are turf especially for schools to absorb impact and reduce the chances of bumps and bruises. By installing artificial turf at your school grounds and play areas in Melbourne, you can relax, knowing that your turf are virtually maintenance free. Say goodbye to dusty playgrounds caused by droughts or mud baths from heavy rains. Our amazingly durable products will make your landscape look great all year round without the need of watering and mowing. Our grass is also UV stabilised so that it can retain their colour even under the harsh Australian sunlight. All you need for that lush looking school landscape is an occasional quick spray with a water hose or mild detergent for stains. We provide maintenance and turf cleaning services to ensure that your new school grass is looked after for many years. Although synthetic grass are highly durable, they are still prone to damage. When your fake turf encounters wear, repairs can easily be restored to bring them back to life. Our team can visit your school to determine the condition of the damage and recommend the cost-saving solutions to repair it. Request a Free Quote and Measure! 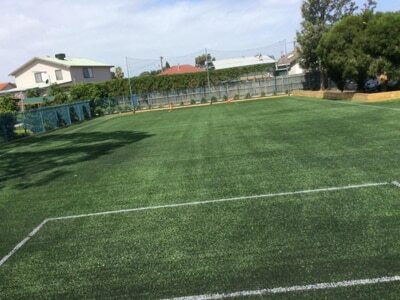 Renew your worn out school grounds today with our quality synthetic school turf installation in Melbourne. Get a free quote and measure by completing our contact form or giving us a call at 0406 686 911.